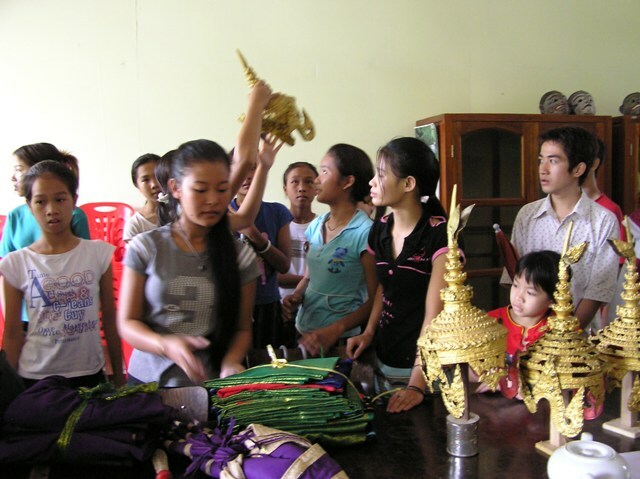 In the summer of 2005, Janet participated in a conference on Cultural Rights in Cambodia. 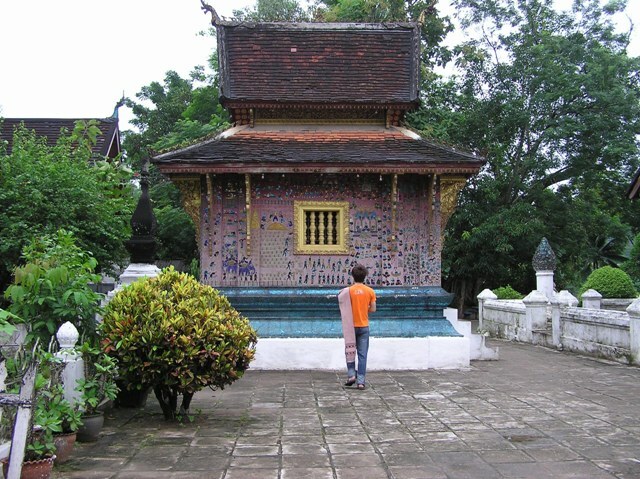 Beforehand, she visited Luang Prabang (Laos) and Angkor Wat (Cambodia) to pursue her interests in UNESCO World Heritage sites. 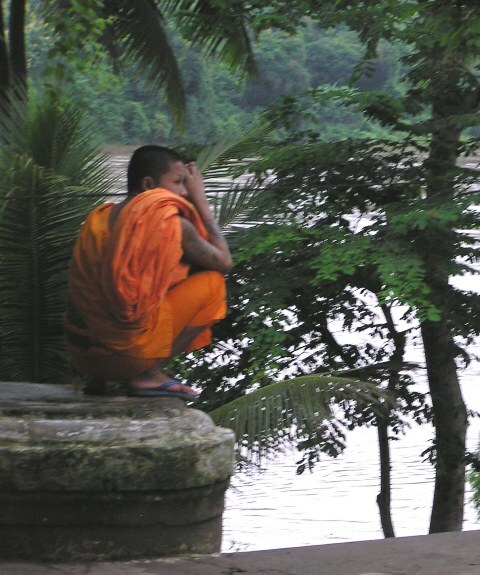 Luang Prabang lies in the tropical montane region of northern Laos at the confluence of two large rivers, the Mekong and the Nam Khan. 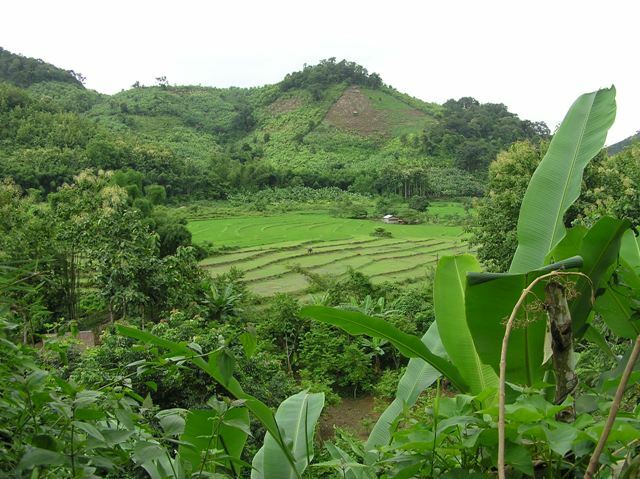 About 80% of Laos's population is rural, practicing wet rice farming on the floodplains and dry rice cultivation along the mountain slopes. 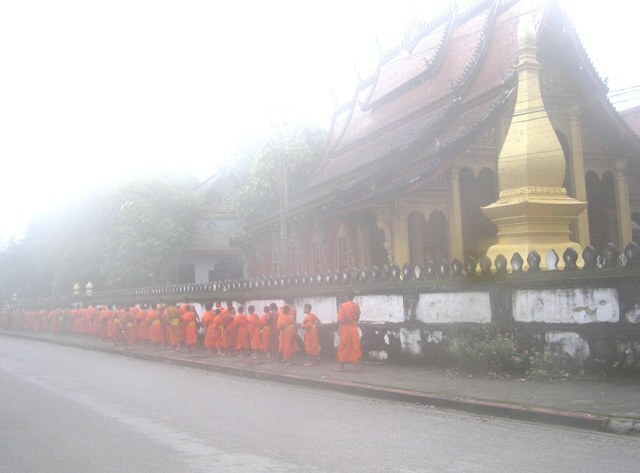 Luang Prabang was established in 1353 as Angkor Wat was in its declining phases. 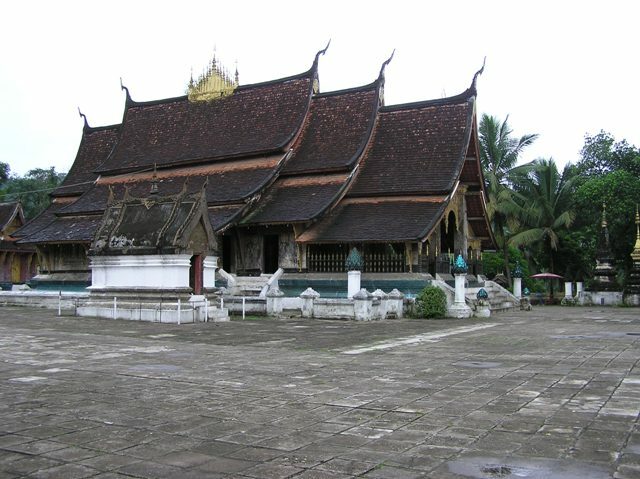 According to both written and oral histories, the Khmer king sent his son-in-law, Chao Fa Ngum, to found the Kingdom of Luang Prabang as a Buddhist state. 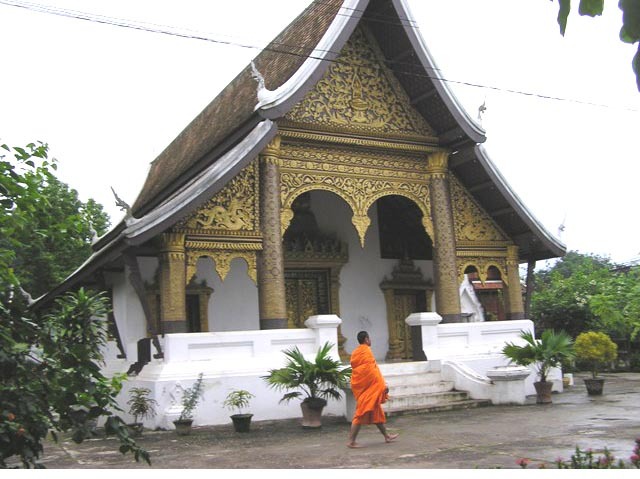 With the help of the Khmers, the royal residence of the Kingdom remained in Luang Prabang for two hundred years before it was moved in 1563 to Vientiane, present capital of Laos. 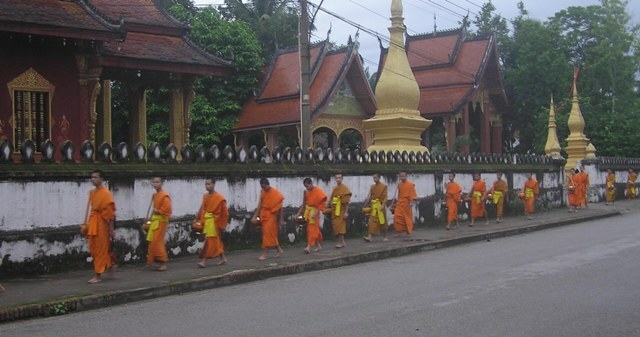 Luang Prabang became a French protectorate in 1893 and remained so until 1953 when the Pathet Lao invasion led to the independence and creation of Laos. War engulfed the region from 1959-1975. In 1975 the monarchy was overthrown and a single-party state established. 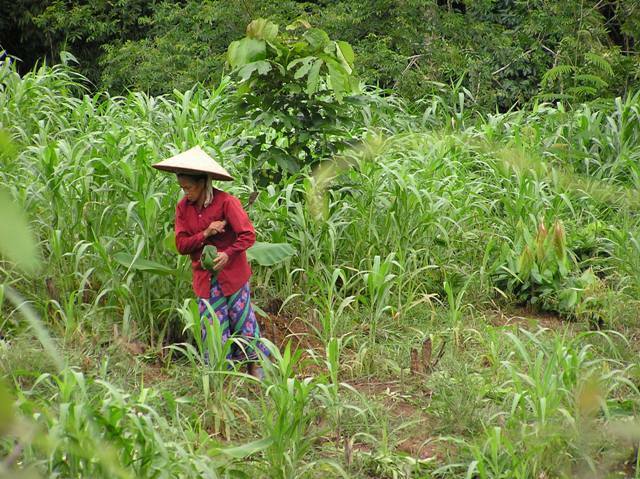 It was only in the late 1980s that the Lao People's Democratic Republic began to open itself to the outside world. 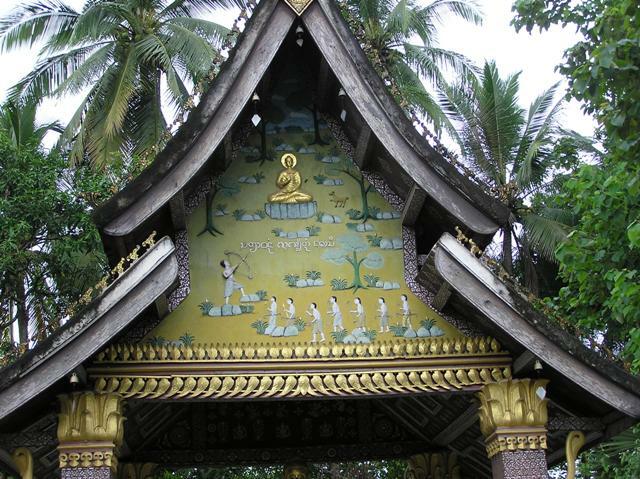 In 1995 Luang Prabang was recognized by UNESCO as a World Heritage Site. 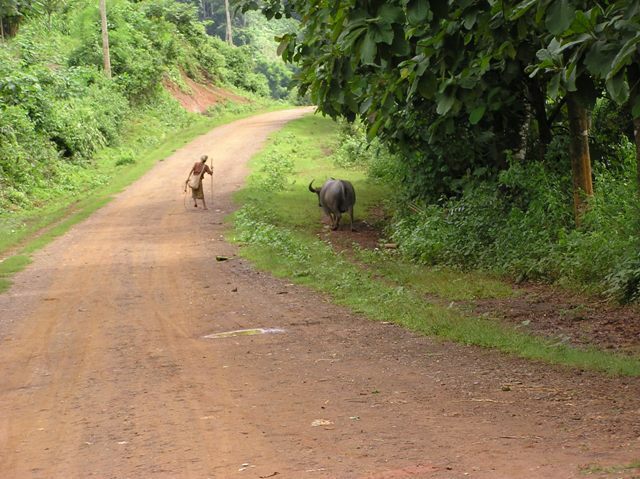 Among plans for the future are tourism for both cultural and natural heritage. An historic preservation effort is underway through local effort, public-private partnerships, and international financing. Temples . 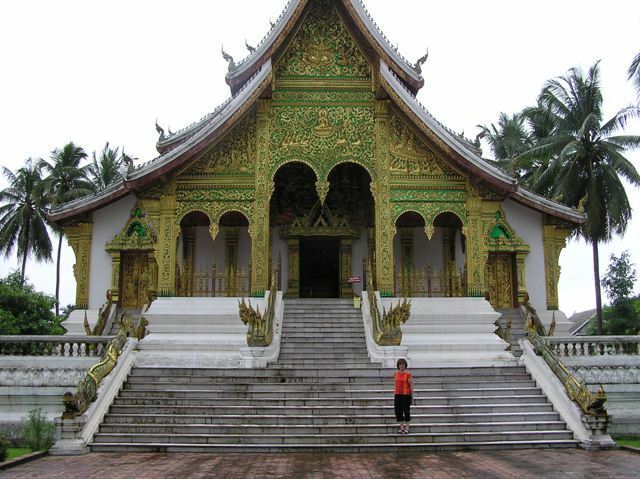 Luang Prabang is known for its palaces, temples, and religious statuary. 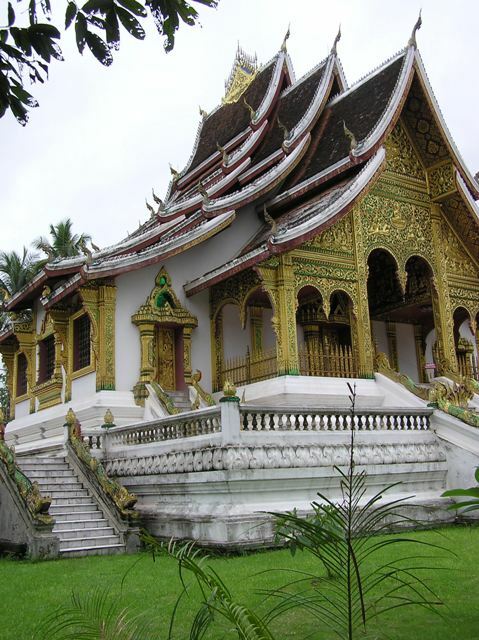 The city is site of no less than sixty-five Buddhist monasteries ( vat or wat ), recognized for their characteristically steep, overlapping roofs; sculpted wooden doors and shutters; colonnades, mosaics, paintings, and many other architectural details. 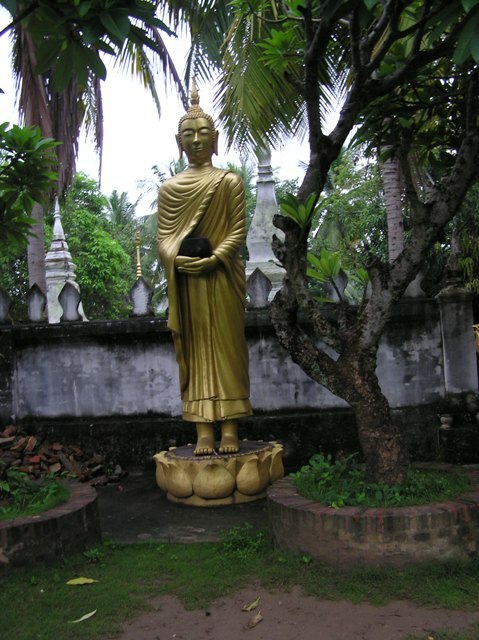 The Pha Bang, a golden image of the Buddha that is said to have been cast in Ceylon in the 1st century AD, is housed on the Palace grounds. 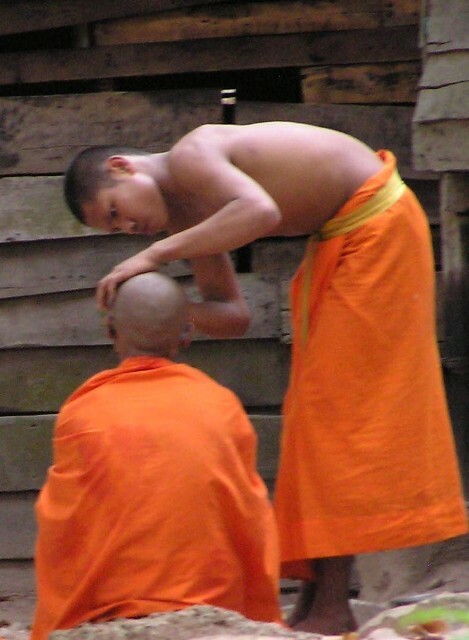 The monasteries continue to house and educate young men. Tourism . 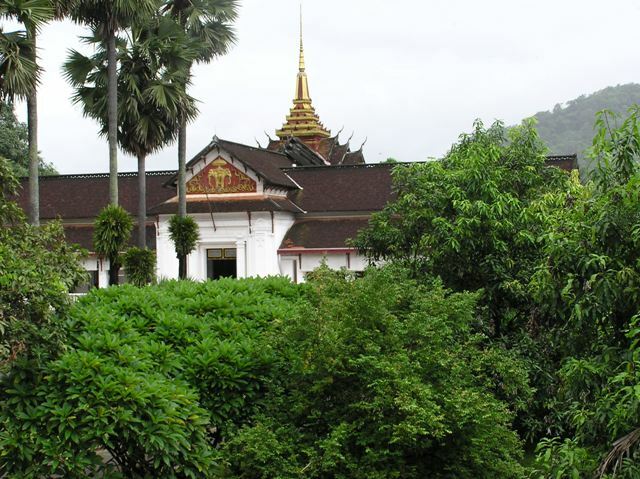 Since denominated a UNESCO World Heritage Site ten years ago, Luang Prabang has experienced a growing tourism market. Many of the hotels, restaurant, and tour agencies are managed by foreigners, a majority of whom are French. 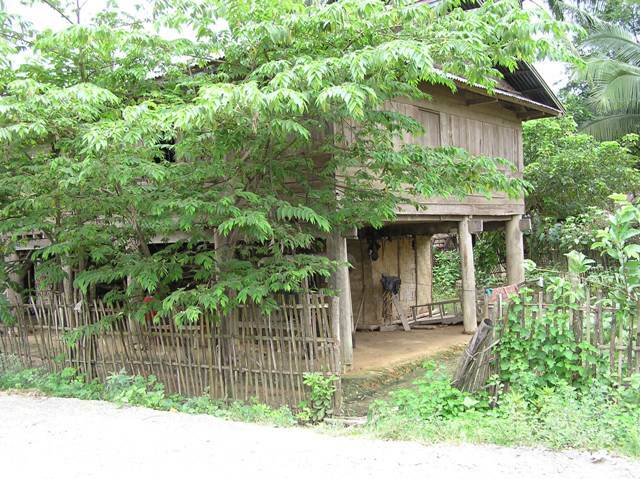 However, Lao law prohibits the ownership of property by foreigners, requiring instead that foreigners lease for no longer than twenty years. 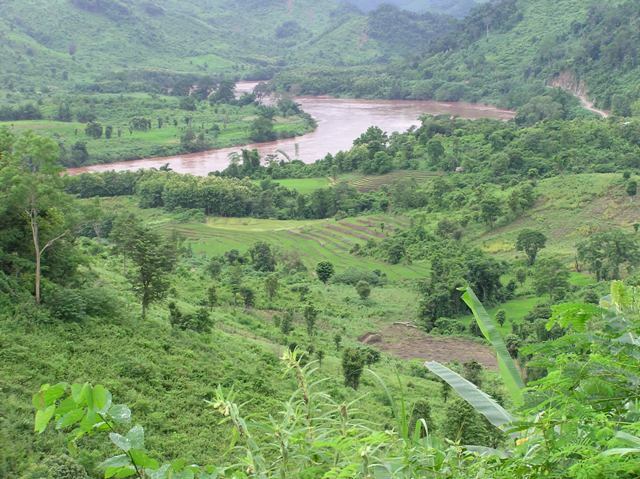 I came across several enterprises that were in transition from French administration to Laotian, suggesting a transfer of capacity in the short period since the UNESCO recognition. 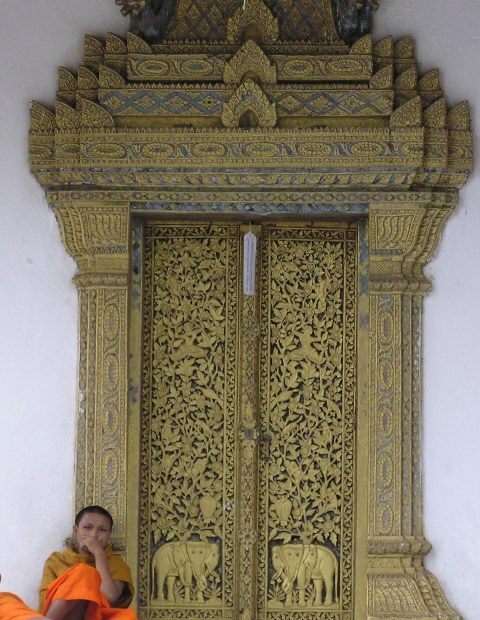 In Luang Prabang I met with numerous stakeholders and other participants in the tourism and preservation enterprise, including UNESCO officials, hotel managers and owners, handcraft cooperatives, and tour agencies. 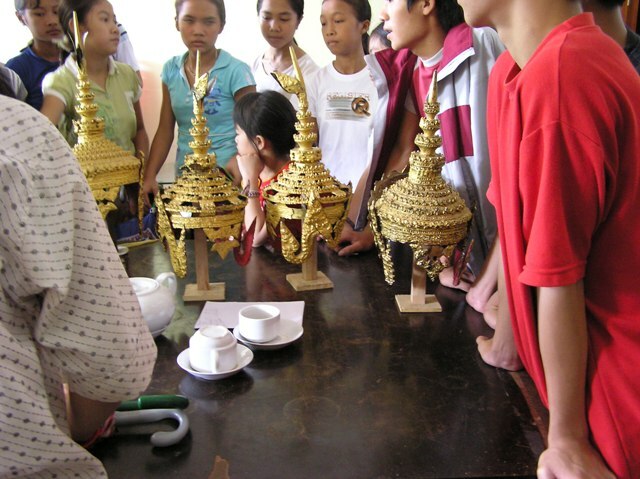 I arranged tour of my own design to a silk-making village in northern Laos. Ethnicity. 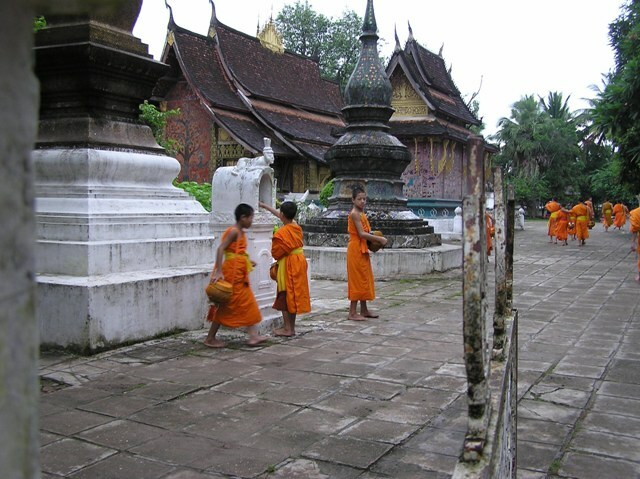 The nation of Laos is said to be home to over eighty distinct ethnicities. We visited a village of Tai Lue speakers, who reportedly migrated from southern China where speakers of closely related languages live today. 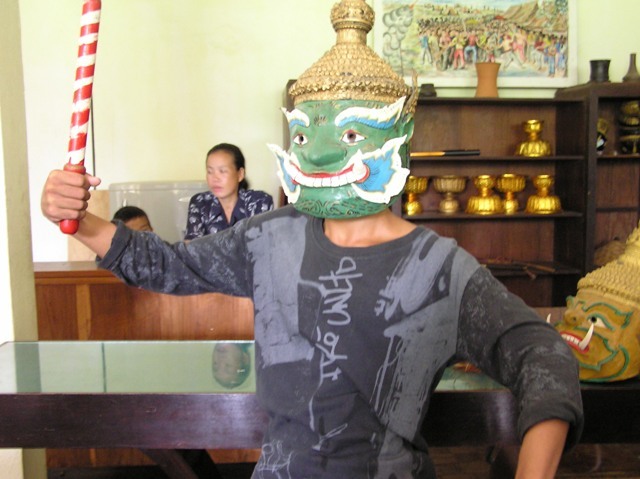 There are also members of this language group in Vietnam and Thailand. 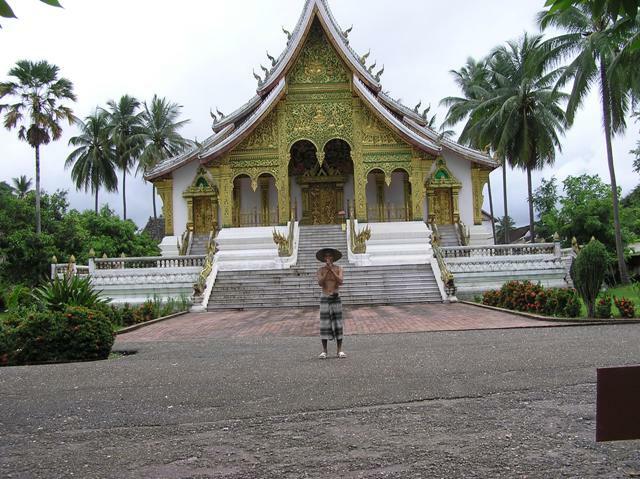 Sheila Dauer and I visited Ban Ta Bu, a village of Tai Lue speakers, about two hundred kilometers north of Luang Prabang along the Nam Ou River. 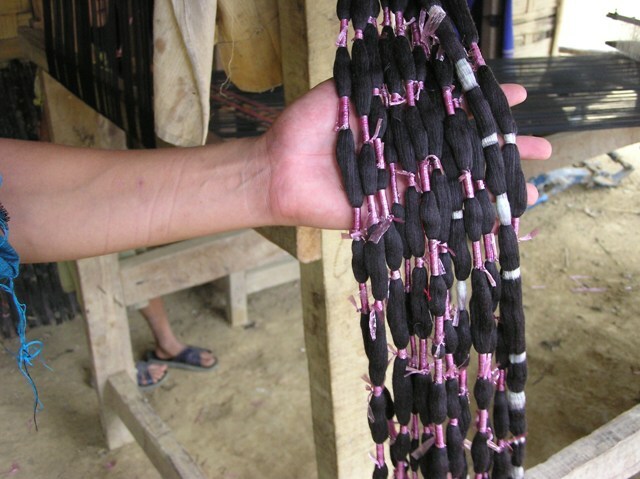 Sericulture . 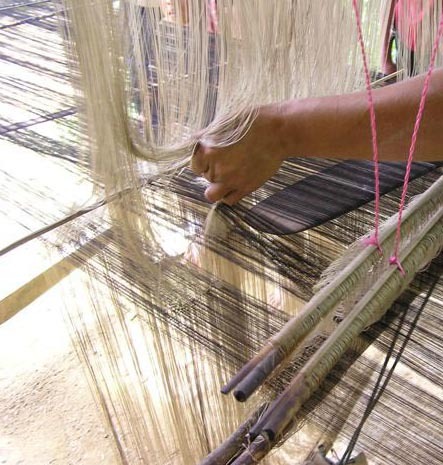 The silk textiles of Laos are among the best in the world. 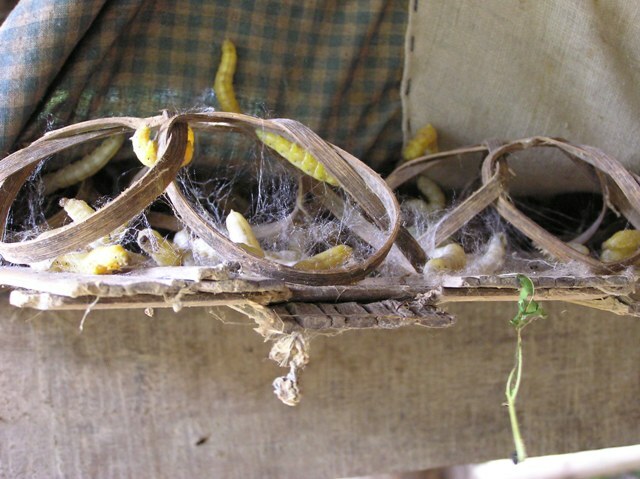 The first step in silk production is the care and cultivation of the domesticated silk-worm through the cocoon stage, a process known as sericulture. 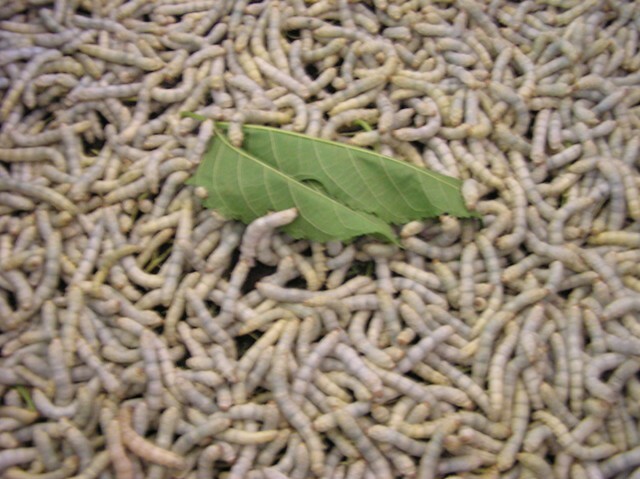 The worms are kept in large covered baskets and fed mulberry leaves three times a day until they begin to produce the cocoon-making secretion. After about 3-4 weeks of maturation the worms are moved to flat shelves lined with simple basketry rings where they continue to weave their cocoons in and around the rings. When the pupae mature, the adult moths abandon the cocoons. 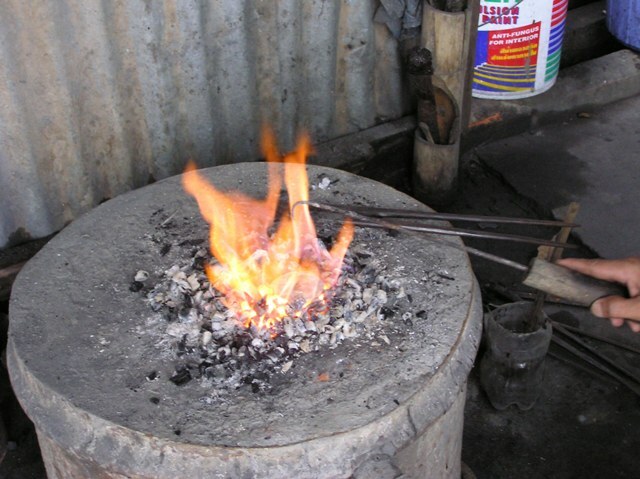 The empty cocoons are gathered and thrown into boiling water, where the fibers will loosen so that they can be spun. 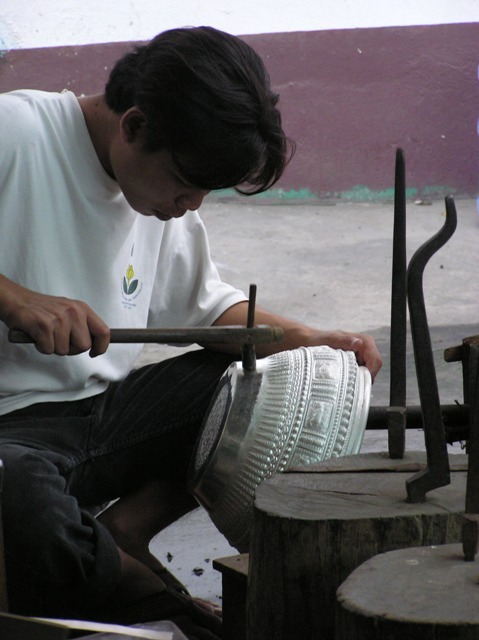 Hand-made dyes are derived from natural products, including teak and indigo leaves, tamarind and rosewood barks, tumeric roots, and ebony seed pods. According to Stephanie Lesage, an expert on the subject, a single yarn is made from 40 cocoons; each worm produces about 400 ms of yarn; and one kg of raw silk requires 8-10 kg of cocoons. Weaving . 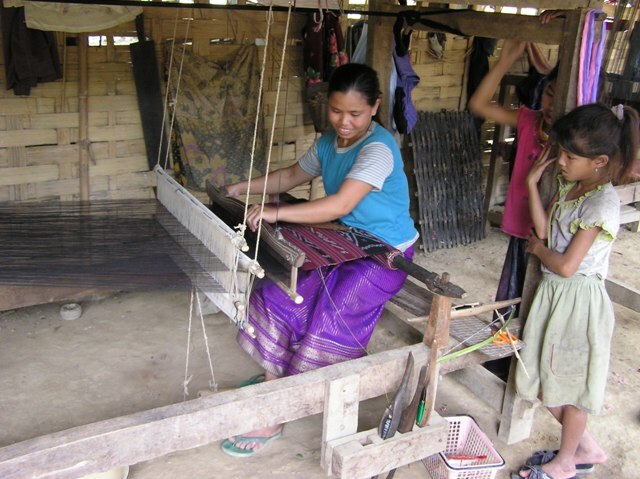 In Ban Ta Bu, all of the women we met were weavers. Each had a standing loom with foot pedals, several combs, and a seat -- typically set up in a space under the house. 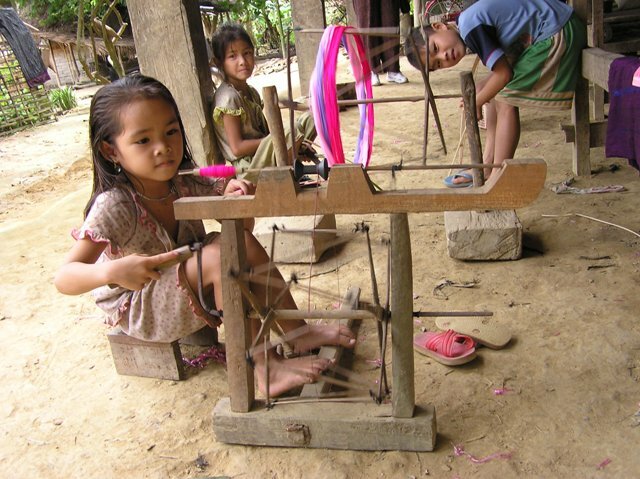 Several women told us that they learned their weaving from their mothers and we saw girls as young as five assisting in the spinning and weaving processes. 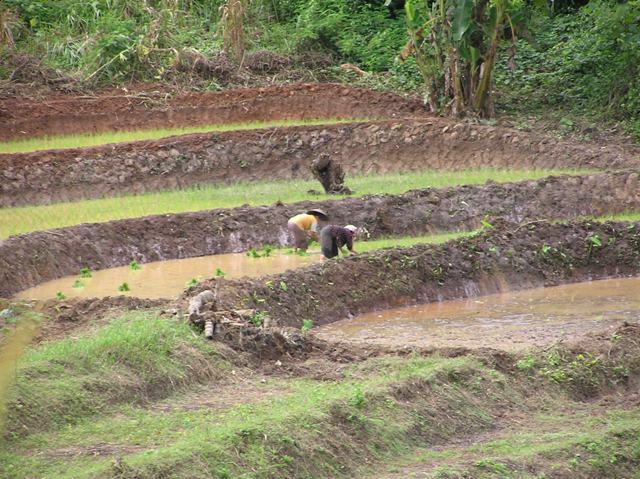 We were told that one could trace a design to a village. These complex designs have to be mastered. Although the conventionalized patterns appeared to be abstract to our unskilled eyes, in fact they are based in natural representations. Each motif is named and has a range within which it is stylistically recognizable. One of the most common design elements is known as the Serpent (Naga -- a prominent Hindu and Buddhist symbol that is said to be an ancestor of the Lao); this motif progresses in alternating right angles (zig-zag style) vertically through the length of a piece of cloth. 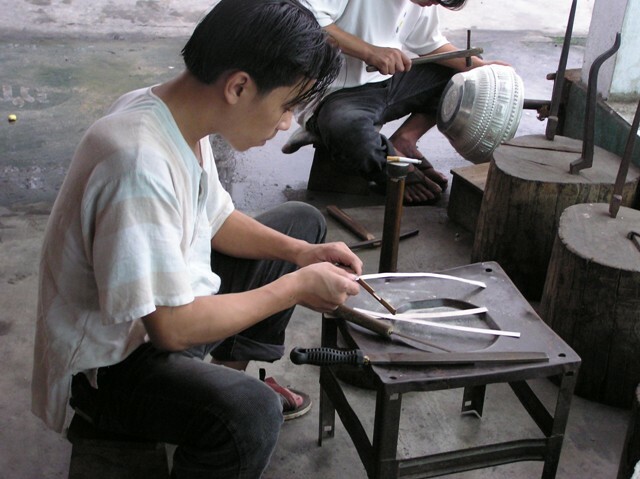 The Butterfly design element consists of two horizontally-attached triangles. 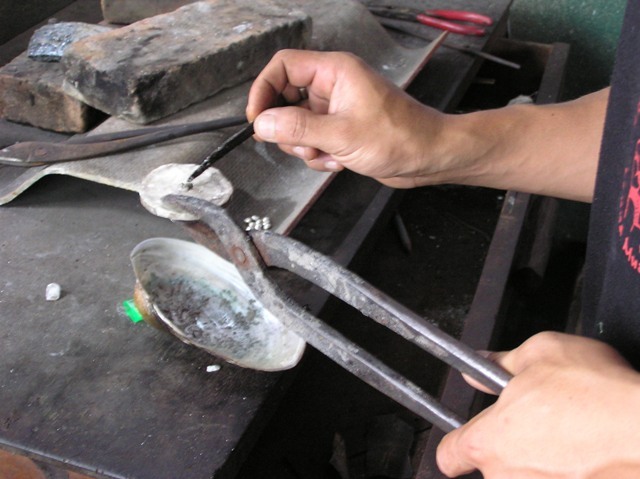 The Crab design element is a simple diamond shape. The design element known as "Temple Roof " is a peak, or arrow shape with design fill and is typically placed at the ends of the fabric. Other common forms are the Bird and the Elephant motifs. We think naming and visualizing the design assists in handing down a complex technique from one generation to the next -- in this case, mother to daughter. It also creates parameters for acceptable variation and allows for recognizable, stylistic marking among different villages. 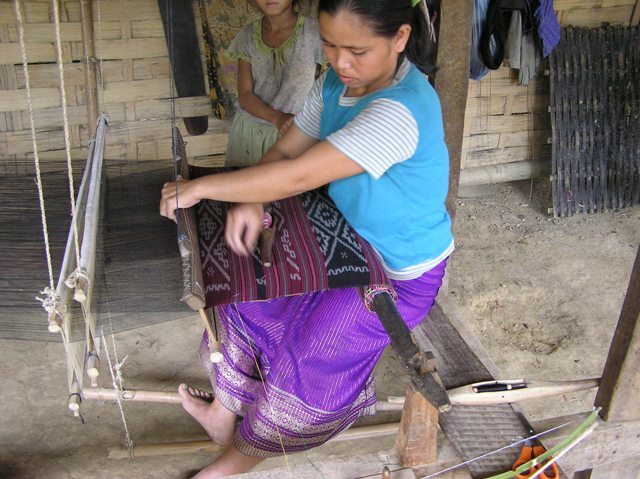 We were shown two different weaving techniques: Ma'mi (known to us as ikat) and Khit. 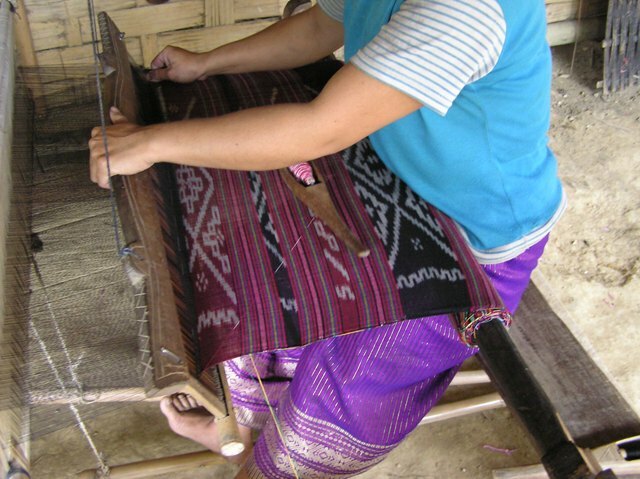 Ma'mi or Matmee (Ikat) is a process in which the warp threads are dyed according to a pattern prior to weaving. 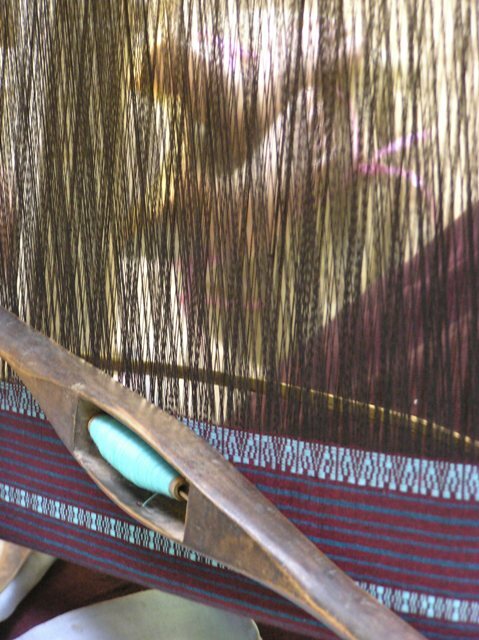 The long skeins of the warp threads are tied around a frame, and wrapped (tied) with ribbon in select spots so that those will not be colored. After the skeins are dyed, and the ribbons removed, the dyed warp threads retain the design that will be woven through the weft threads. After doing this any number of times, the dyed yarns are spun onto spools (or quill) and woven to create a design that appears to "bleed." 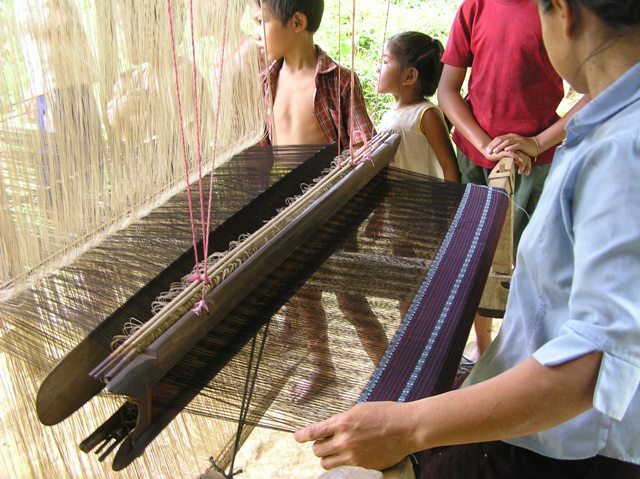 Khit is a process of weaving where a heddle holds sticks in place so that they separate warp threads. 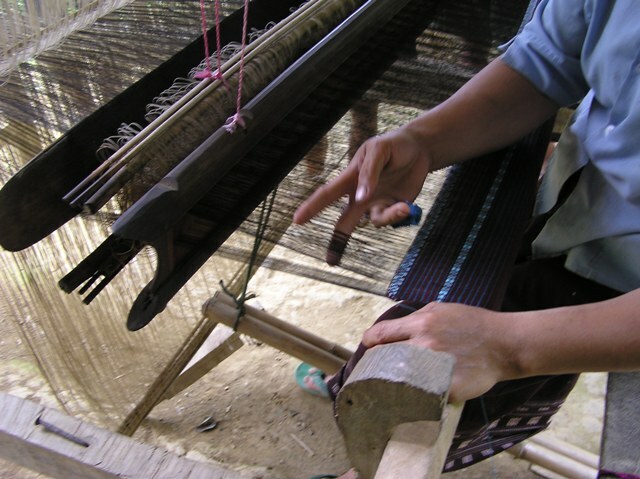 In this type of weaving, a woman must count the threads and hold them above and below the warp with each throw in order to create a pattern. 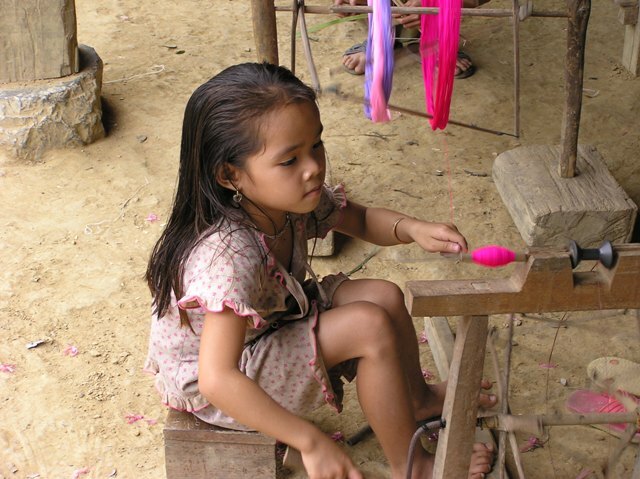 The weaver shifts the position of the pedals to raise and lower the yarns. She switches the position of the pedals and the sticks and repeats the motion of throwing the shuttle. 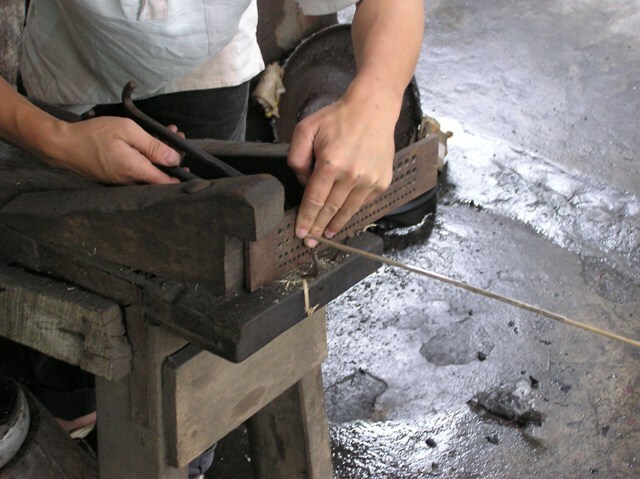 After each throw of the shuttle, she tightens the weave using a "reed." The weaver can change colors by placing a different spool in the shuttle.